Mather Mansion was the home of the iron-mining millionaire, Samuel Mather. The style of the house is Tudor Gothic Revival. The 45-room house was completed in 1910 and cost more than one million dollars, the most expensive house ever built in Cleveland at the time. 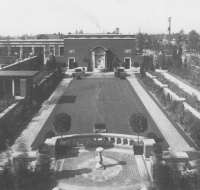 In 1973, the mansion became the first to be included in the National Register of Historic Places.